Had the opportunity to finish up the workday at home after getting my daughter off the bus and then taking her over to her Brownie Troop outing. Temperature today was a balmy 70 degrees and the whole afternoon it looked like it was going to rain. 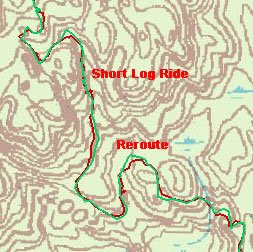 Once I was done with work I hopped on the 'Horse wearing a dayglo green riding jersey and hammered out a quite 5 mile ride in Upper Paugussett State Forest in the waning late afternoon sunlight. I went for the Echo Valley Loopy ride because it covers the most distance in the shortest amount of time. 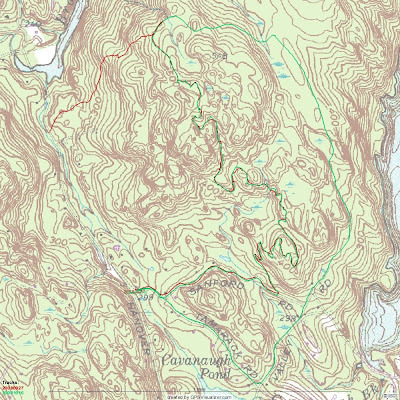 The other track (red) in the map above is really there to provide a little reference so that I can show where the trail reroute is from the work that was done on the Gussy Trail last weekend. Unfortunately, the map doesn't do a good job of showing where the Short Log Ride is either. I took some pictures of it last weekend but they don't do it justice, either, however I did have plenty of before pictures so if you really want to get a sense of this area, I suggest you follow the above link and see what I mean. I hit the short log ride and cleaned it on the first try. Unfortunately, I didn't have a lot of time so no video this time around. I will try to shoot something this weekend. The picture below is of no where in particular but it exemplifies the serenity of the forest during autumn. Another of layer of leaves have fallen atop the layer from the last year and the layer from the year before and the layer before that one. All these layers weigh down on the base layers decomposing the leaves and creating humus.